Last week, I had the excellent good fortune to run a directing intensive with Will Davis during the NNPN Conference, at the Kennedy Center, in Washington DC. I had a marvelous time and I wanted share some thoughts about the experience. 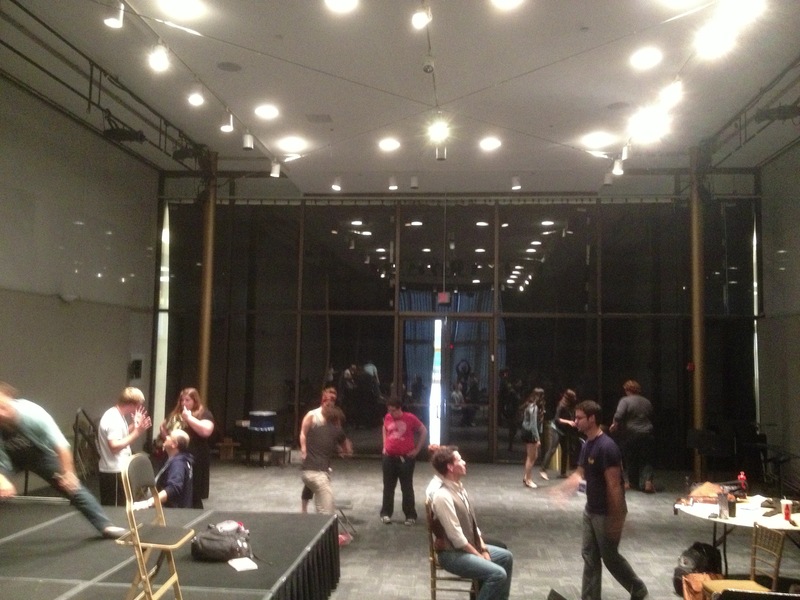 The impetus for the Kennedy Center Directing Intensive came out of this HowlRound that Will Davis wrote last year. Will wanted to write about new play infrastructure and the role of the director in the development of production and opportunities for new work directors. Shortly after it was published, Gregg Henry of the Kennedy Center challenged Will to “Do something about it” and asked me if I would be interested in working with Will. I happily accepted and over the course of a month via phone meetings, we made plans for a series of meetings that we hoped would push a group of young directors to think critically about the role of a director in a new play development environment. Outside of graduate school training, the list of developmental resources and funds geared towards directors is incredibly slim. The lion’s share of opportunities go to residencies and workshops structured for playwrights. These opportunities are of course rich and important places for collaboration and new work development, but they are also rooms where directors are often tethered to the phrase, “the director in service of the playwright.” We believe it’s time to dream up new modes and methods for developing the craft and artistry of the emerging American director and new definitions for words like “the play” and “the text.” Our vision, of course, includes the playwright driven workshop but also dreams about the director driven workshop and expands beyond that to consider a more holistic view of playmaking and performance that engages a more dynamic collaborative model. In terms of “the intensive” we wanted the directors to recognize unique role that a director plays in developing new work, and to give them a sense of the tools that a director has, and what they can use when they approach a production. We structured the week to ensure that there was a balance of activities and we provided avenues for three different aspects of director training; observing, theory, and practical experience. Each director was assigned to watch one of the NNPN directors in the rehearsal room. They were responsible for observing and participating in the process (if the director allowed for it). The directors were encouraged to meet with their mentor-director, and to take careful notes on the process since it is rare to given a chance to watch a working, professional director as they rehearse with the Equity actors on a new play. We encouraged our intensive directors to watch for the tools their mentor was using to shape the room. We asked them to consider where they saw places of resonance between themselves and the director they were observing. Day 1: What makes for a good assistant director? If interested,I wrote a long blog post about it, here. Day 2: What is a collaboration, and how do you open/start a new play development rehearsal room? What does collaboration mean? What are effective strategies for collaboration? What are the tools that a director has? What does it mean to direct? Day 3: What is a director’s interpretation? What constitutes a “bad” interpretation vs a “good” interpretation? What is a balance between clarity and straightforward storytelling, vs. a visceral feeling? Day 4-Strategies for communication: How do you talk to a playwright, vs how do you talk to an actor? 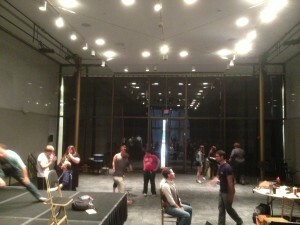 What does it mean to work with a dramaturg? How do you shape and guide a discussion and how to do you give effective notes? Day 5-Lunch with Les Waters. We asked Les to share his background and philosophy on new play development. Day 6: What is the responsibility for a new play director? From your experiences here this week, how has your director worked with the playwright? How has their presence in the room been a benefit to the play? We assigned one large practical assignment; to come up with an directorial vision for one of two plays Crumble: Lay Me Down Justin Timberlake by Sheila Callahan or Which Witch Hwich by Mac Wellman.” Both of these plays require a strong directorial hand and need an interpretation to anchor them. We asked the participants to spend the week studying and to create a “First day speech” where you lay out your vision for the piece. We believe that a director’s invitation to the play that should ignite creativity in the imagined room of collaborators, and clearly detail a vision for the piece and themselves as the leader of that vision. We chose those plays because they were not quite in the canon of new plays. I wanted to expose these young directors to plays with unique structure, that are not “director proof” but instead require a director to create a logic and structure their own vision of the text. In this way, I hope that they would not feel “in service” to the text to simply follow the stage directions, but recognize that their responsibility to the text is to interpret the words on the page for a physical production. Additionally each night we assigned short composition assignments that allowed the directors to develop different approaches to the work. These were short (no longer than two minutes!) presentations on aspects of the two plays. Each group was given a chance to work on a short selection of text with a group of actors, and then assigned to create a work with using a tabletop and common objects to create their compositions. In both compositions, we stressed using the tools of space and time, as well underlining the formal aspects of visual composition (line, balance, symmetry, color, etc) to focus the directors on the aspects of visual storytelling. Additionally, Will and I made ourselves available to consult with the students about careers in the theater, resumes, portfolios, paths towards jobs, and to talk about whether or not it is worth it to get MFAs. One of the evening sessions, we paired with the Dramaturgy Intensive, led by Mark Bly, and explored alternative models of director/dramaturg collaboration. The evening culminated with a practical exercise in talking with a dramaturg about “Which Witch Hwich” to talk about the structural elements of the play that could be a basis for an eventual production.